Returning Favorites and Some New! 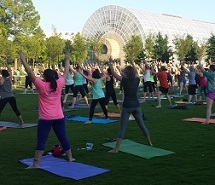 Oklahoma City, OK – the Myriad Gardens will be bringing back event favorites including Dancing in the Gardens, Barre3 Free Community Workouts, Full Moon Ride/Run. The Gardens honors Mothers on Mother’s Day and proudly participates in National Public Gardens Day. We’re also introducing new events such as The Art of Flowers on Thursday, May 11 and OKC Garden Fest on Saturday, May 13 and a few others. Further information can be found online at myriadgardens.org, @myriadgardens through social media or contact by phone at (405) 445-7080. Barre3 returns to the Gardens for another season of community outdoor fitness. A $5 suggested donation will be requested to continue our growth of the Myriad Gardens. Other dates are: June 5, 7pm; July 3, 7pm; August 7, 7pm; September 4, 6pm; and October 2, 6pm. This is a great all-levels class led by Lisa Woodard, owner of This Land Yoga. Class participants should bring a yoga mat and water. Classes will meet in the south lobby for check-in each week. Drop in for a session or two or enjoy the entire series. Dancing in the Gardens featuring The Salsa! We kick the Dancing in the Gardens season off with Cinco de Mayo. Join us as we transform the Seasonal Plaza into an urban dance space. Beginning at 7 p.m., instructors Marti Rickman and Kelly Forbes from Hips and Clips Studio will give a dance demonstration followed by a FREE lesson for all. At 8 p.m., DJ Red Handed will crank up the Salsa tunes to get the dancing started. Drink and food specials will be offered to highlight the night. Additional dates for Dancing in the Gardens are Friday, June 2 featuring the Swing and Friday, July 14 featuring Hip Hop. Join us for a morning of exploring the plants and creatures that live in our ponds and streams at Myriad Botanical Gardens. First, we’ll make pond viewers out of recycled material, and then we’ll put them to use as we get an up-close view of underwater wildlife and make observations of what we see in and around the water. We’ll end the class by creating and sharing colorful drawings of what we discovered outside. The Full Moon Run: Your favorite health and wellness activity is back. Join other runners in a 5K, led by Ultramax Sports Oklahoma, through the downtown as the sun sets. The Full Moon Ride: Bring your bike and meet up for a leisurely one hour ride led by Schlegel Bicycles. Don’t have a bike? Use Spokie’s Bike Share. Other dates through October include: June 7, July 8, August 7, September 11, October 5. National Public Gardens Day is a day to honor and draw attention to our nation’s public gardens. The Myriad Gardens joins hundreds of public gardens nationwide to bring national awareness to public gardens and the impact they have on their communities. The Myriad Gardens will offer 2-for-1 admission on this day! Myriad Gardens Foundation will present an elegant luncheon to celebrate the art of floral arranging while helping to support the Gardens on Thursday, May 11, 11:30 a.m. to 1 p.m. Co-chaired by Annie Bohanon and Dannie Bea Hightower, guests will enjoy a garden-to-table seasonal lunch prepared by Chef Kamala Gamble in the Park House Events Center. Dundee Butcher, a master floral arranger and owner of the fashionable Russian River Flower School in Napa Valley, California, will demonstrate how to create gorgeous floral arrangements for special occasions or everyday enjoyment. Timed to coincide with Mother’s Day weekend, OKC Garden Fest will have 40 vendor booths who will feature herbs, perennials, roses, produce, pottery, jewelry, wineries, food products and food trucks. Activities for children will also be offered and there is no charge for attending. Start a butterfly garden or Monarch Waystation, an intentionally-managed garden that offers food and habitat for the Monarch butterfly population. Vendors to date include: 360 Farms, CD3 Farm/ Tap your Health Source, Celtic Supercenter, Duck Creek Farms, Garden Anywhere Box, Grahams Jewelry Box, Jo’s Garden Shop, Laughing Rabbit Soap Co., Lost Creek Mushroom Farm, K&K Nursery and Landscape, Laughing Rabbit Soap Co., Mustang Creek Alpacas, Oklahoma Nature Conservancy, Oklahoma State Beekeepers, Peppers and More, Plant Wisdom Garden Center, Prairie Wind Nursery, R&E Plants “The Herb Place”, Roses Inc. Green Country, Sierra Club, Skyridge Farm, Southern Plant Farm, Tall Grass Prairie Soap, Tinroof Studios, Utopia Gardens, White Dog Chiles, Wild Horse Canyon Farms, Wild Things Nursery and Wine and Palette. As you walk among all the amazing booths at OKC Garden Fest, drop in to get creative and a little messy. We’ll walk kiddos (or adults!) through making their very own seed bomb to take home. We’ll also talk about all the awesome seeds in the mix – what they’ll grow into and offer to your garden. Join Wine and Palette at the Gardens to create a unique piece of art. On this day we’ll make “Fancy Flowers” on at 16×20 canvas. The Myriad Gardens will celebrate moms on Mother’s Day 2017. Moms get free admission with one paid family member. Kamala Gamble and Barbara Mock, chefs and gardeners, run Guilford Gardens, a local CSA (Community Supported Agriculture) Garden that grows delicious and organic produce in the heart of Oklahoma City. Join us for a tour of this beautiful garden followed by an amazing dinner prepared by Kam and Barbara using their own produce. Note: Rain date, Thursday, May 25, 5:30-8:30pm. Join us to expand your Oklahoma plant knowledge and get great ideas for your yard. Each month changes as the plants grow through the seasons; in May we’ll highlight plants for water conservation. Can’t make it for the guided tour? Pick up a self-guided handout in our South Lobby. Join us in the Gardens as we take a journey through a caterpillar’s transformation into a beautiful butterfly. The Children’s Garden will transform into a colorful and magical place inspired by Eric Carle’s book The Very Hungry Caterpillar. Enjoy crafts, activities and imaginative displays that will capture the essence of one of the most beloved children’s stories.